3 days, 2 nights – Exciting Short 3 Days Delta Motorbiking. Day 1: Hanoi – Mai Chau. ~200 km, ~6 h.
Today is the first day of this exciting short 3 days Delta motorbiking. Before starting to ride, we will have a short briefing to let you know about the rules. In addition, the guide will show you how to understand him by his body language. We start around 9.30am after the rush hours. Beautiful landscape. In fact, you retrace mountain roads to Tan Lac. Generally speaking, this is a bumpy road but very quiet and peaceful. We bypass the Cuc Phuong Park and spend the night in 2-star Van Xuan Inter-hotel Complex. There are two temples in Hoa Lu, Dinh Dynasty (968-980) and Early Le Dynasty (980-1009) which are well preserved. This is the old capital of Vietnam with the natural protection afforded by the region’s bizarre landscape. Ride to the back of Yen Ngua Mountain along the mountain range, snaking through limestone 8 km until Linh Xuan village. This secondary road is narrow but newly sealed and easy to drive. There is a possibility to take many photos of this region and the landscape look like Halong Bay without water. We can talk with local people we meet on the way and have a cup of tea with them. Ride to Ninh Binh (~1 km from Linh Xuan village) along the rice fields or straight from Linh Xuan village to Tam Coc and finally Bich Dong (~8 km) to visit the 3 pagodas, of which two are built into the cave. We propose a short boat trip (~30 minutes) to discover the 700-m cave under the mountain. 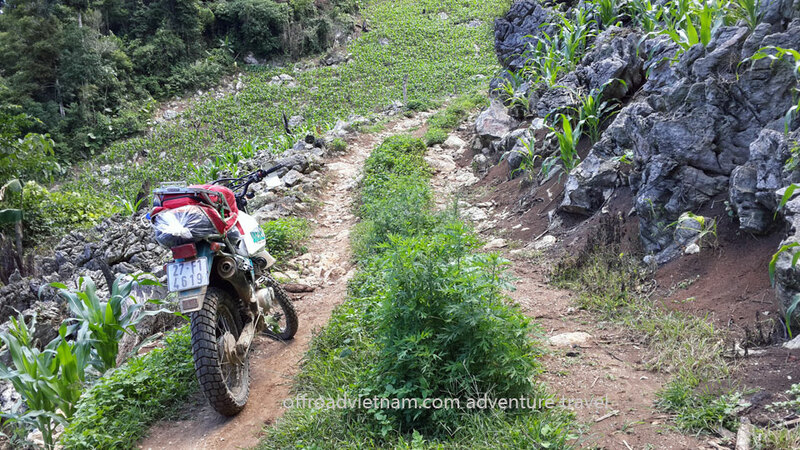 Contact us now to book this tour or to know about different itineraries and options of this exciting short 3 days Delta motorbiking in Vietnam. The video below has some portions of this exciting short 3 days Delta motorbiking. In case you want to watch more videos of our Vietnam motorbike tours please check our YouTube channel.